Note: All the functions in this class are reentrant, except setRedirected(), redirected(), and restoreRedirected(). viewport(), window(), worldMatrix() make up the painter's coordinate transformation system. For more information, see the Coordinate Transformations section and the The Coordinate System documentation. matrixEnabled() tells whether world transformation is enabled. All the tranformation operations operate on the transformation worldMatrix(). Матрица преобразует одну точку на плоскости в другую точку. For more information about the transformation matrix, see the The Coordinate System and QMatrix documentation. The setWorldMatrix() function can replace or add to the currently set worldMatrix(). The resetMatrix() function resets any transformations that were made using translate(), scale(), shear(), rotate(), setWorldMatrix(), setViewport() and setWindow() functions. The deviceMatrix() returns the matrix that transforms from logical coordinates to device coordinates of the platform dependent paint device. The latter function is only needed when using platform painting commands on the platform dependent handle, and the platform does not do transformations nativly. 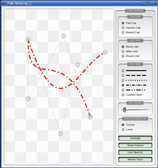 When drawing with QPainter, we specify points using logical coordinates which then are converted into the physical coordinates of the paint device. The mapping of the logical coordinates to the physical coordinates are handled by QPainter's combinedMatrix(), a combination of viewport() and window() and worldMatrix(). The viewport() represents the physical coordinates specifying an arbitrary rectangle, the window() describes the same rectangle in logical coordinates, and the worldMatrix() is identical with the transformation matrix. Note that composition transformation operates pixelwise. For that reason, there is a difference between using the grahic primitive itself and its bounding rectangle: The bounding rect contains pixels with alpha == 0 (i.e the pixels surrounding the primitive). These pixels will overwrite the other image's pixels, affectively clearing those, while the primitive only overwrites its own area. 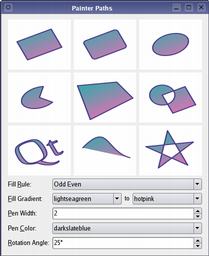 If you are using coordinates with Qt's raster-based paint engine, it is important to note that coordinates greater than +/- 215 are not valid due to the use of short int in the implementation. 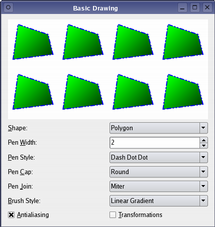 See also QPaintDevice, QPaintEngine, QtSvg Module, and Basic Drawing Example. Defines the Porter-Duff rules for digital image compositing. Composition modes are used to specify how the pixels in one image, the source, are merged with the pixel in another image, the destination. QPainter::TextAntialiasing 0x02 Indicates that the engine should antialias text if possible. It is advisable to use combinedTransform() instead of this function to preserve the properties of perspective transformations. See also setWorldMatrix(), setWindow(), and setViewport(). Note: It is advisable to use deviceTransform() instead of this function to preserve the properties of perspective transformations. See also worldMatrix() and QPaintEngine::hasFeature(). Fills the given rectangle with the given brush. Initializes the painters pen, background and font to the same as the given widget. Call this function after begin() while the painter is active. Returns the replacement for given device. The optional out parameter offset returns the offset within the replaced device. See also setRedirected() and restoreRedirected(). Resets any transformations that were made using translate(), scale(), shear(), rotate(), setWorldMatrix(), setViewport() and setWindow(). It is advisable to use resetTransform() instead of this function to preserve the properties of perspective transformations. Restores the previous redirection for the given device after a call to setRedirected(). See also setWorldMatrix() and Coordinate Transformations. 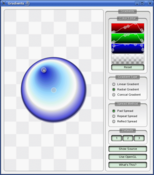 The brush origin specifies the (0, 0) coordinate of the painter's brush. This setting only applies to pattern brushes and pixmap brushes. 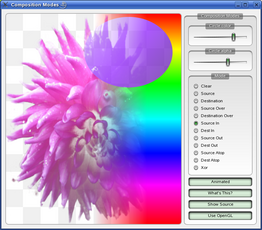 Warning: You can only set the composition mode for QPainter objects that operates on a QImage. Redirects all paint commands for the given paint device, to the replacement device. The optional point offset defines an offset within the source device. The redirection will not be effective until the begin() function has been called; make sure to call end() for the given device's painter (if any) before redirecting. Call restoreRedirected() to restore the previous redirection. In general, you'll probably find that calling QPixmap::grabWidget() or QPixmap::grabWindow() is an easier solution. See also redirected() and restoreRedirected(). This function has been added for compatibility with setMatrix(), but as with setMatrix() the preferred method of setting a transformation on the painter is through setWorldTransform(). Sets the transformation matrix to matrix and enables transformations. Note: It is advisable to use setWorldTransform() instead of this function to preserve the properties of perspective transformations. If combine is true, then matrix is combined with the current transformation matrix; otherwise matrix replaces the current transformation matrix. Note that when using setWorldMatrix() function you should always have combine be true when you are drawing into a QPicture. 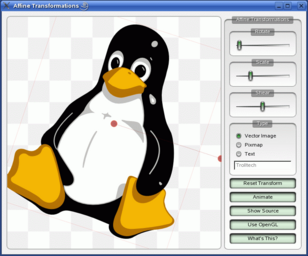 Otherwise it may not be possible to replay the picture with additional transformations; using the translate(), scale(), etc. convenience functions is safe. 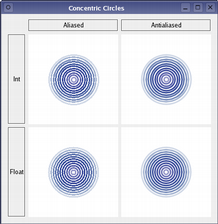 For more information about the coordinate system, transformations and window-viewport conversion, see The Coordinate System documentation. See also worldMatrixEnabled() and QMatrix. See also worldMatrixEnabled(), worldMatrix(), and Coordinate Transformations. See also setViewTransformEnabled() and worldMatrix(). It is advisable to use worldTransform() because worldMatrix() does not preserve the properties of perspective transformations. See also setWorldMatrix(), Coordinate Transformations, and The Coordinate System. See also setWorldMatrixEnabled(), worldMatrix(), and The Coordinate System. Рисует простой прямоугольник начиная в точке (x, y) с заданными шириной width и высотой height, используя заданные painter, lineColor и lineWidth. Внутренняя часть прямоугольника заполняется кистью fill если fill не равна 0. Предупреждение: Эта функция не выглядит как QWidget::style() или QApplication::style(). Используйте функции рисования в QStyle чтобы сделать виджеты, которые соответствуют текущему стилю ГПИ. Смотрите также qDrawShadeRect() и QStyle. Рисует обычный прямоугольник, заданный прямоугольником rect, используя заданные painter, lineColor и lineWidth. Внутренняя часть прямоугольника заливается кистью fill если fill не равна 0. Рисует горизонтальную (y1 == y2) или вертикальную (x1 == x2) линию с тенью, используя заданный painter. Обратите внимание на то, что не рисуется ничего если y1 != y2 и x1 != x2 (т.е., линия не является ни горизонтальной, ни вертикальной). Предоставленная палитра palette задаёт цвета тени (цвета light, dark и middle). Переданная lineWidth задаёт ширину линии для каждой из линий; это не общая ширина линии. Переданная midLineWidth задаёт ширину средней линии, рисуемой цветом QPalette::mid(). Линия появляется вдавленной если sunken равно true, в противном случае - выпуклой. Смотрите также qDrawShadeRect(), qDrawShadePanel() и QStyle. Рисует горизонтальную или вертикальную линию с тенью между точками p1 и p2, используя заданный рисовальщик painter. Обратите внимание на то, что ничего не рисуется если линия между точками не является ни горизонтальной, ни вертикальной. Рисует панель с тенью начиная в точке (x, y) с заданной шириной width и высотой height, используя предоставленный рисовальщик painter и заданную lineWidth. Заданная палитра palette задаёт цвета тени (цвета light, dark и middle). Внутренняя часть панели заливается кистью fill если fill не равно 0. Панель появляется вдавленной, если sunken равно true, в противном случае - выпуклой. Смотрите также qDrawWinPanel(), qDrawShadeLine(), qDrawShadeRect() и QStyle. Рисует панель с тенью в прямоугольнике, заданном rect, используя заданные painter и lineWidth. Рисует прямоугольник с тенью начиная с точки (x, y) с заданными шириной width и высотой height используя предоставленный рисовальщик painter. Предоставленная палитра palette задаёт цвета тени (light, dark и middle). Переданная lineWidth задаёт ширину линии для каждой из линий; это не общая ширина линии. midLineWidth задаёт ширину средней линии, рисуемой цветом QPalette::mid(). Внутренняя часть прямоугольника заполняется кистью fill если fill не равна 0. Прямоугольник появляется вдавленным, если sunken равно true, в противном случае - выпуклым. Смотрите также qDrawShadeLine(), qDrawShadePanel(), qDrawPlainRect() и QStyle. Рисует прямоугольник с тенью, заданный rect, используя заданный рисовальщик painter. Рисует кнопку в стиле Windows, заданную точкой (x, y}, шириной width и высотой height, используя предоставленный рисовальщик painter с толщиной линии равной 2 пикселям. Внутренняя часть кнопки заливается кистью fill если fill не равно 0. Заданная палитра palette задаёт цвета тени (цвета light, dark и middle). Кнопка появляется вдавленной если sunken равно true, в противном случае - выпуклой. Предупреждение: Эта функция не выглядит как QWidget::style() или QApplication::style()-> Используйте функции рисования QStyle чтобы сделать виджеты, которые следуют текущему стилю ГПИ. Смотрите также qDrawWinPanel() и QStyle. Рисует кнопку в стиле Windows в прямоугольнике, заданном rect, используя заданный рисовальщик painter с толщиной линии равной 2 пикселей. Внутренняя часть кнопки заливается кистью fill если fill не равно 0. Рисует панель в стиле Windows, заданную точкой (x, y), шириной width и высотой height, используя предоставленный рисовальщик painter с толщиной линии равной 2 пикселям. Внутренняя часть кнопки заливается кистью fill если fill не равно 0. Заданная палитра palette задаёт цвета тени. Панель появится вдавленной, если sunken равно true, в противном случае - выпуклой. Смотрите также qDrawShadePanel(), qDrawWinButton() и QStyle.